If you've been reading our blog or following us on Facebook, you are probably aware of what I can only think to describe as either the Battle of the Blogs or Blogominoes. 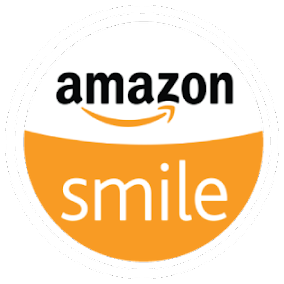 One blog fueled another, and another - from Washington to Michigan to Florida - and the dirty gardeners' fingernails came out... onto the keyboard. 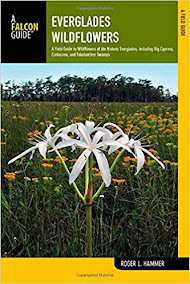 Description Florida is known for beautiful beaches and theme parks but the “Sunshine State” is also home to the native and endangered Platanthera ciliaris! Of the other 9 native Platanthera species, 5 are listed by the state as endangered or threatened. Commonly known as the yellow or orange fringed orchid, it is easy to see how P. ciliaris got its common name. As for its botanical name, consider that the margin of the flower's labellum looks as though it has fine whiskers or cilia - hair-like projections (figure 2). This terrestrial orchid is not one to hide; when in bloom it can reach up to 3 feet tall (figure 1). Are Natives the Answer? Professor Cregg, Why Are You Asking? The Seattle Department of Planning and Development is focused on long-term green priorities (water and material conservation, sustainable transportation and healthy landscapes) and working on a draft of some new "Green Code Provisions." These provisions were presented to the public on August 13, 2012. Comments and questions were encouraged. 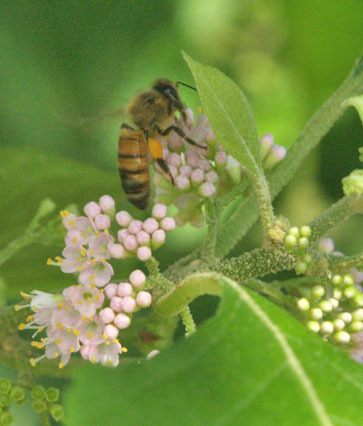 • Existing invasive plant species shall be removed and no invasive species planted. 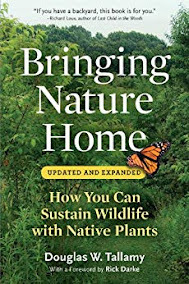 • 75% of all new plantings will be native to Western Washington. 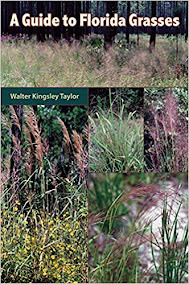 • A vegetation plan must be submitted for review. 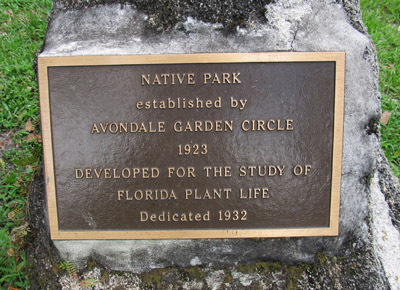 • Existing native plant species shall be protected whenever possible. The orchid family, Orchidaceae, is one of the largest flowering plant families in the world. 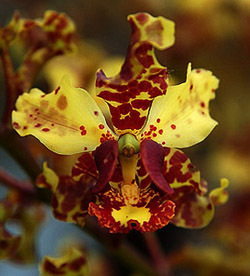 It is so large that there are actually more orchid species than twice the number of bird species! 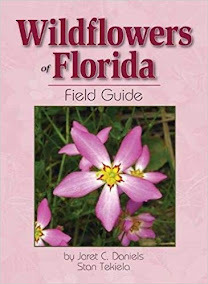 In Florida, we are lucky to have so many 109 native species, varieties, and hybrids. Unfortunately, 56 of those species are listed as endangered in Florida. The state also has 13 non-native species. 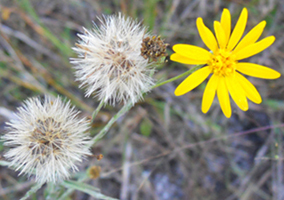 Narrowleaf silkgrass is a showy perennial wildflower, a native throughout all of Florida, and a must for any wildflower connoisseur. 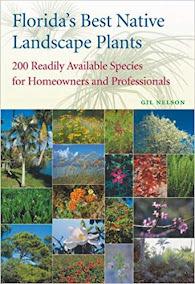 It is found in mesic (intermediate between wet and dry) to xeric (dry) pineland and prairie habitats. As a result, it tolerates drought fairly well once established. It is a member of the Sunflower Family (Asteraceae), and is a great attractor for pollinators. Its stalkless ray and disc flowers are clustered tightly together to form a capitulum, which is commonly referred to as a "head" (Fig. 1). Upon maturity, plants are generally less than 18 inches in height, and produce 20-30 blooming heads on several branches. 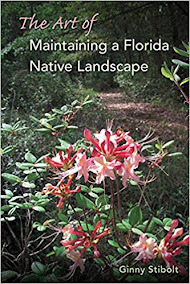 The Florida Native Plant Society bestows various awards to members and chapters for their contributions to the mission of the organization. The Green Palmetto Awards were established in 1986 by Sherry Cummings (then FNPS President) to honor those who had given special service to FNPS. Three Green Palmettos, ordinarily presented at the FNPS annual conference, are awarded each year for (1) service or education, (2) science, and (3) the outstanding chapter of the year. 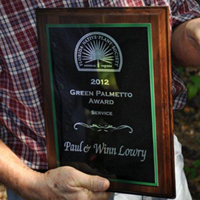 The 2012 Green Palmetto Award for service was given to Paul and Winn Lowry. 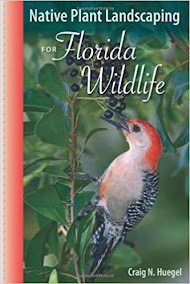 It was presented by the board of Southern Brevard County's Conradina Chapter on July 31, 2012. Conradina nominated Paul and Winn because of their longstanding membership and chapter involvement. Although their address changed one year ago, their loyalty to FNPS remains the same. They are currently members of the Pine Lily Chapter in Osceola County.